There was a time when pre-industrial women had to make everything from the ground floor up - I’m saying they had to mill the wheat, milk the cow, gather the eggs and pick the berries. I dare say, with as hard as they worked, even women back then had the guilt gene and must have felt some level self-reproach from improper milking techniques or inadequate egg and fruit gathering. Then there was an era of cooking and baking that followed where it is a certainty that women felt guilty because they weren’t grinding their own flour, but rather buying the flour, as well as, other ingredients from the general store. They were measuring and mixing all the recipe components by hand, but it is indisputable that such laziness displayed in securing their fixings from the local mercantile, had tongues wagging about their slothful ways in the kitchen. Many were likely considered witches for taking that first indolent step. Subsequently women were shamed and are still mortified to admit that they are using store bought cake mixes. It should be realized that cake mixes, brownie mixes and the like merely eliminate a few steps. Prepackaged baking ingredients save time by mixing baking powder and baking salt with the flour or combining the sugar and cocoa powder. This is, however, considered by some an act of apathetic culinary responsibilities and indifference. Those brazen women who buy all meals and baked goods already prepared from the supermarket feel further dishonor and a form of female buyer’s remorse. The Goddess declares that it is okay if you don’t like to cook and bake - all women are not born loving cooking. Let’s talk about shaming and guilt for a minute. Women who don’t cook or don’t make things from scratch aren’t part of the evil empire. In this day and age it has evolved that more women are part of the workforce, children have more activities and the state of our homes and gardens have higher standards. There was period when women didn’t go to work, no one had to be driven to soccer practice and store bought ingredients just weren’t available so women who did not work were doing their part to build a family home. Today, that is no longer the standard. Regardless, the chauvinism continues, even by our own gender. Stop bullying women into the kitchen! That being said, there are comforts from things made with your own hands. Taking time to cook and bake beside all your other responsibilities does mean you are giving of yourself, in true goddess fashion. Remember a goddess is both human and divine. If you love to cook and bake from scratch that’s great, it is a creative process and homemade foods from carefully chosen ingredients can be very scrumptious. But, lets be real, semi homemade is equally delicious. Goddess Sandra Lee put pride in Semi-Homemade. She fought a hard battle for women - other professional chefs bullied her and even women tormented her. She did not claim her meals were haute cuisine, but they were still yummy, some quite delicious, and her tablescapes and settings were pretty and enchanting. Anyone would feel warm and fuzzy sitting down to that kind of flavor and charm. A food snob simply doesn't understand what other people’s time, responsibilities, financial situations and interests are. Some people live to eat and some eat to live; everyone is not a foodie. 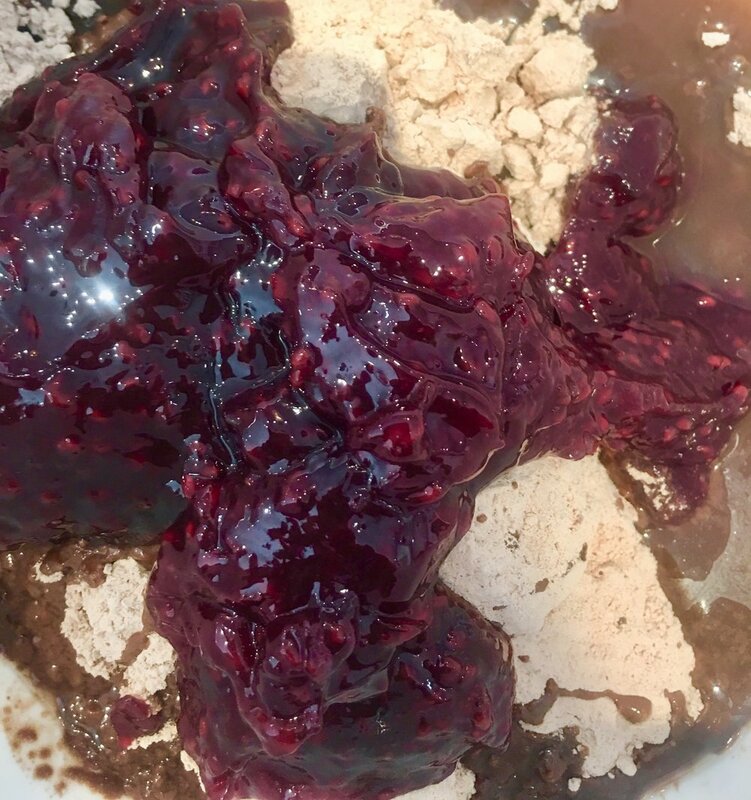 The Chocolate Goddess and Goddess on the Go have gotten together to make a delicious moist and fudgey raspberry brownie that can be baked in the blink of an eye and frosted lickety-split. Despite the heat of summer we still need chocolate desserts. This brownie accomplishes so much in one small square – it’s delicious, quick to make and makes whomever eats it, feel cared for. Preheat oven to 350 degrees for metal or glass pan. 350 degrees for dark pan. Spray an 8 x 8 baking pan with PAM® Butter spray. Combine all brownie mix, raspberry pie filling, oil and raspberry extract. Melt chocolate, butter and corn syrup in microwave at power level 3 for 30 seconds and stir. Add 10 second intervals at power level 3, until almost but not all chips are melted. Remove and stir until completely melted. Glaze brownies and let set. Top with Raspberry Cheesecake Gelato and Fresh Raspberries.